The Rundown - What Does CocoPPa do? 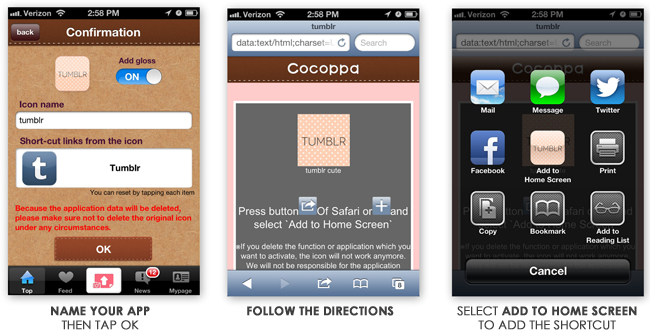 CocoPPa lets you swap out the app icon or image associated with your installed app by creating a shortcut through Safari. You must still keep the original app. DO NOT DELETE the original app in other words, you need to keep it so the shortcut knows where to go. Simply move all the apps you've swapped over to another page - like the last page or into a folder by placing one app on top of another - but do not delete them! 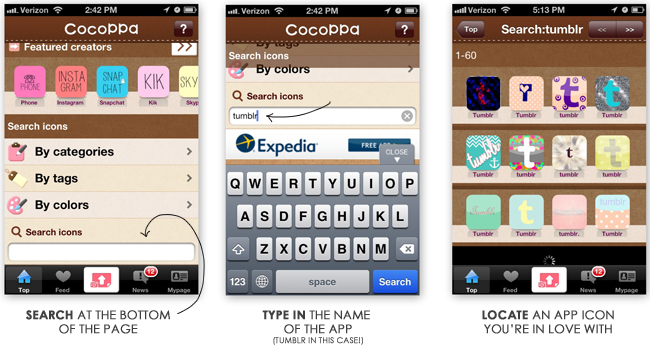 You'll also need to keep the CocoPPa app on your phone. It will also take a bit - a second, not even - to open the app when you click it's swapped icon. Since you're creating a shortcut, tapping on the swapped icon redirects you to the app. It's not as instant as tapping on the app itself, which you have kept in a separate folder on your phone. So you may want to pretty up only a few app icons. Try it out. See what you think, personally I'm not bothered. So, once you've created your account you can begin to find icons for the apps you'd like to swap. This may take a while as you can search through what I'm sure are millions of icons! You can sort by color, category, & tags or you can search by name at the bottom of the home page. You can even upload your own but I haven't tried that yet. The homepage also shows you new & popular icons...so you can look through there if you like. Let's start with swapping out a downloaded app like Tumblr. 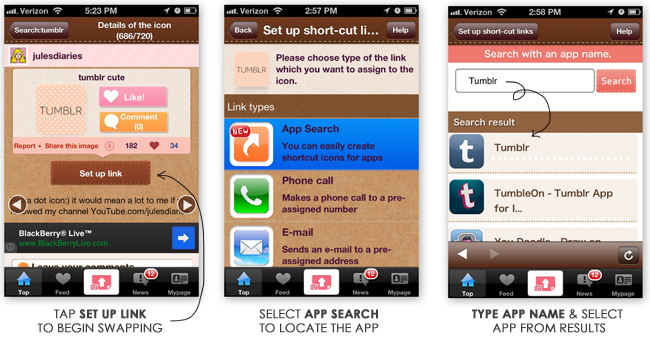 Begin by searching for your app name at the bottom of the home page, in this case Tumblr. 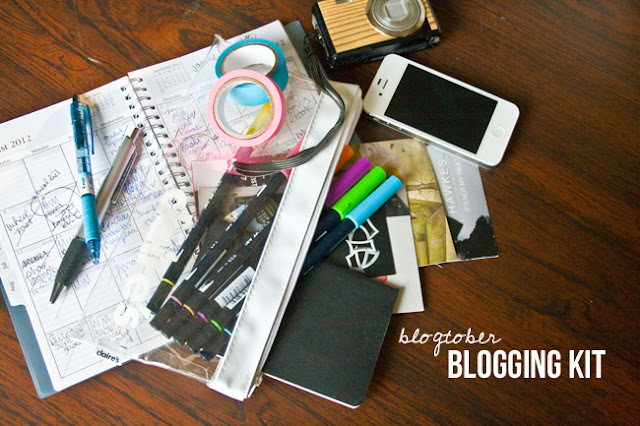 You'll be led to pages & pages & PAGES of icons! Just flip through until you find one you like. If you want to compare a few, tap the image & tap like next to the icon. This will add it to your likes. See your likes by going to Mypage at the bottom of the app. Compare & choose! Once you've found one you like, you're ready to swap. Tap the icon. 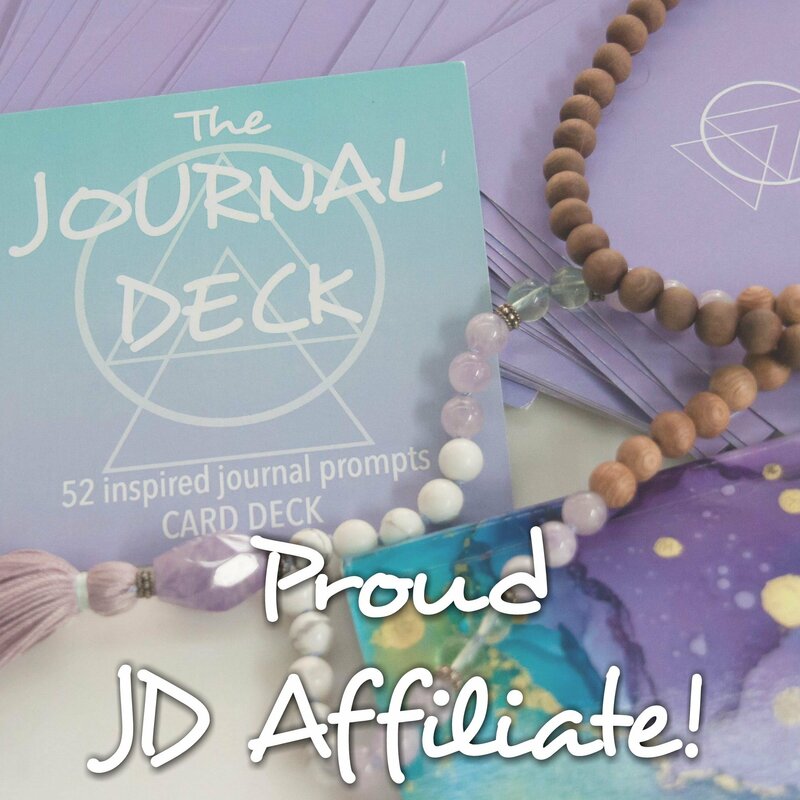 Once you're taken to it's page click Set up Link. You'll tap App Search to find the app to swap. Type in the app name & select the app from the results. Depending on your app, you may have to flip through a few pages. This is what I had to do to find my alarm clock app. 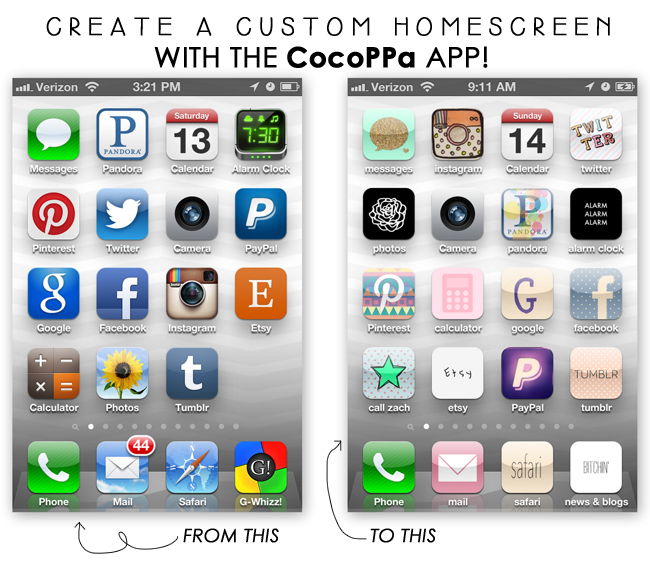 Cocoppa will let you know if you have the app on your phone or if you need to download it as well. Now, name your app. Give it a new name or the original name of the app (my G-Whizz! app for all things Google says blogs & news, for example). Tap OK to begin setting up the shortcut. You'll be redirected to a Safari page. Follow the directions & add the image to your home screen. Now, you'll be taken back to your phone's app pages where you will see the icon you just added. Sweet! Now put the new icon wherever you want by holding your finger on it until it starts to shake. Move the old icon to the last page of your phone or into a folder but remember DO NOT DELETE THE APP ITSELF! If you ever want to delete the shortcut you made, simply hold your finger on the icon until it starts to hover then press the black x. You won't delete the original app, just it's shortcut. Remember, do not delete the original app. If you do, the shortcut won't know where to direct you to! Like I mentioned before, some app icons can not be switched out for these pretty icons - namely phone, camera, notes, calculator, weather - but there are ways to work around it. First we'll swap out photos by using a url redirect. Start the same way as before by finding an icon that you love. When searching photos, I didn't find an icon I liked so I started looking for miscellaneous icons. I chose a flower since the original photo app has a flower icon just so I could recognize it, that's just me. Choose whatever you'd like. 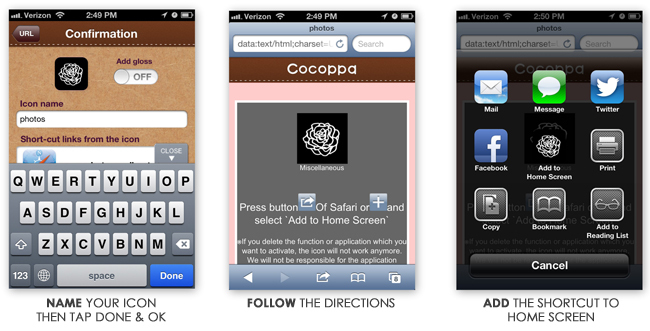 Now follow the same steps as before: select OK to be taken to Safari where you will add the icon to your home screen. Then move it around to where you'd like it to live. Move the original app off to another page. You can use this method for the apps mentioned above. I will say that using the mail & text message shortcut will open the app as a new message, but just hit cancel & you will be able to see your texts or your emails. Now, if you want to replace something such as the calculator, camera, or notes apps you'll have to either deal with the fact that you can't - nor can you change the default camera - or download another app to replace it. For this example we'll do the calculator. There's no shortcut for the preinstalled calculator app, but you can find an icon you love, tap Set up Link, select App Search, and search Calculator. 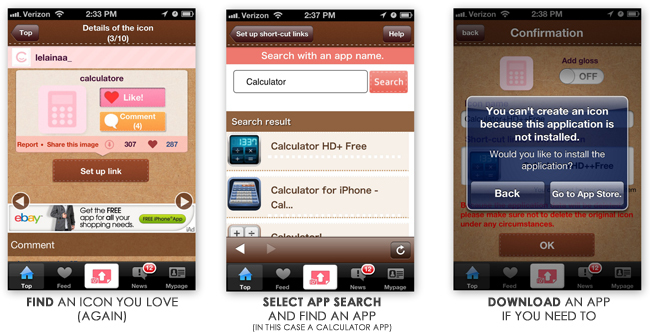 There you will find a list of calculator apps you can replace. 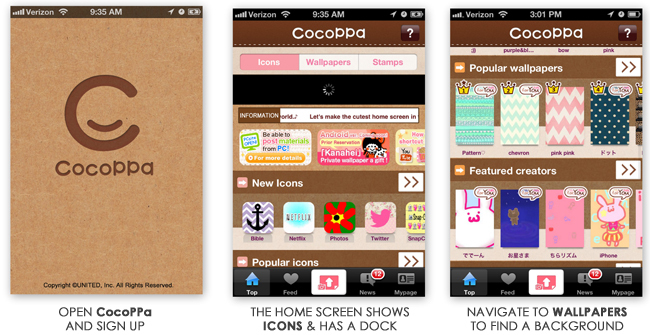 If you don't have an app on your phone, CocoPPa lets you know you need to download it & takes you to the app store. After you've downloaded the app, follow the same steps as before to set up your link & add to homepage. You can do this with apps like weather, notes, & camera but it won't replace the preinstalled apps from Apple. I kept some default icons.....just made it easier for me. Unfortunately you can't replace the default phone app either. But you can create a shortcut to dial a particular person. 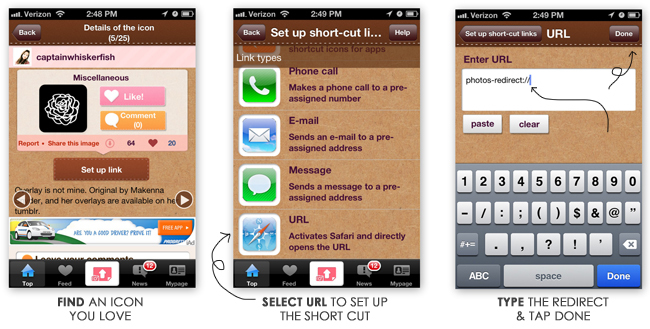 You can also create a short cut for email or text. I think this is pretty cool to keep your fave contacts at your finger tips! This feature is great to make a page of speed dials, text short cuts, or email short cuts. You can find a bunch of miscellaneous icons - icons that don't correspond to anything. I found pictures, shapes, flowers, hearts, bows, etc! You can create a page with these shortcuts to specific contacts - text or call your mom, email your best friend, keep the take out place on speed dial. 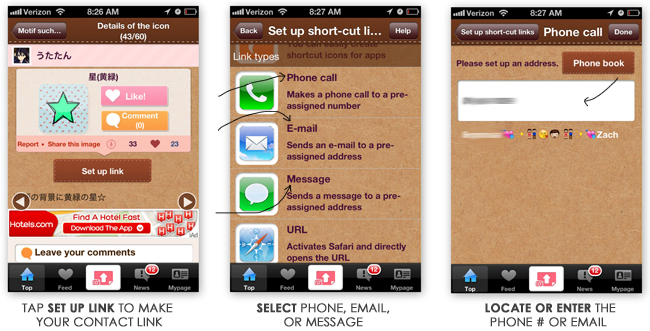 Tapping these shortcuts will immediately call, open up a text, or open up a new email, to this contact. Follow the same instructions to add this shortcut to your homescreen. When you call someone, you're doing the same redirect. I noticed that it redirects you to the CocoPPa app while the phone rings. You need to tap return to call to end the call. I don't advise creating an entire phone filled with swapped icons because your phone will begin to run slow & while reading up on CocoPPa I found people too many of these swaps caused crashes. So do it in small doses. 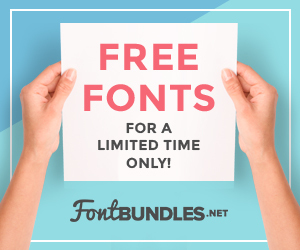 Just do a few, maybe just speed dials for fun, or just a home page, etc. 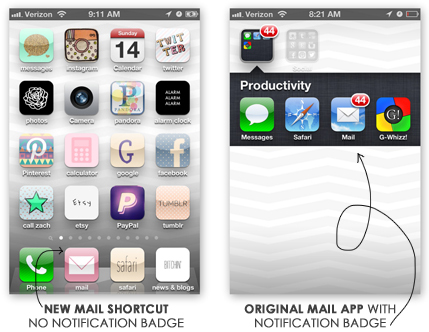 Additionally, any notifications you get will not show up on the new icon meaning the notification badge won't show up. All badges will appear on the original app. Of course you can see your notifications when you tap the new icon because you'll be redirected to the app but you won't have a little red circle waiting for you reminding you. Let me know if you do this! Show me your pretty phone!